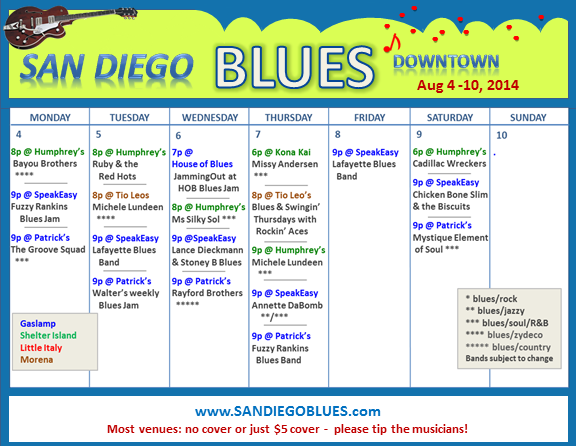 This week most of the live blues music downtown happens Monday-Thursday and again on Saturday. 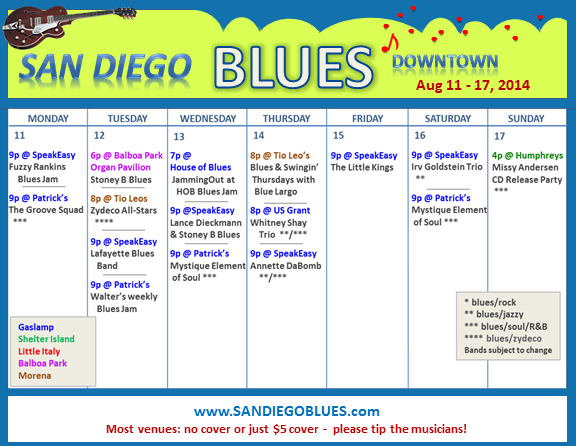 The weekends are often light, but this Labor Day weekend will be particularly slow, although Saturday at the Gaslamp SpeakEasy there will be 2 blues events – one in the afternoon with super talented young adults and kids, and another in the later evening with Stoney B Blues. On Tuesday night, there is a great line up of blues bands and musicians at Proud Mary’s in Kearny Mesa (at the Ramada) who are coming together to raise money for local blues musician, Leo Dombecki, who needs help with medical expenses. It isn’t on my calendar, since its out of the downtown area. But it will be a great night there. This Wednesday at the House of Blues, there will be a featured local band at the blues jam, as there is the last Wed of evert month. This time it will be Leilani Kilgore & the Voodoo Electrics – a band formed out of the youth jams with extremely talented young adults who are committed to playing the blues and keeping the blues alive! 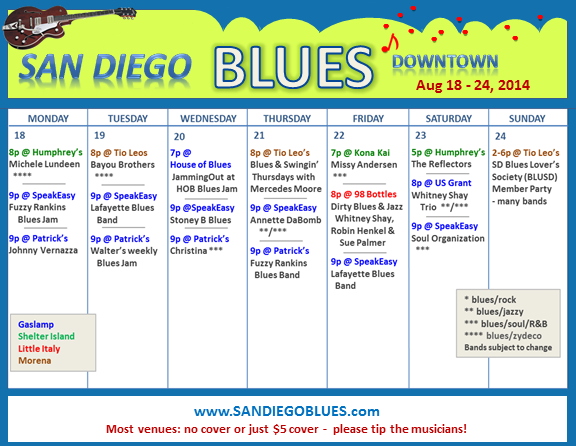 We have a good week of San Diego blues bands, blues jams and bluesy jazz artists coming up – even naughty dirty blues and jazz on Friday night with Whitney Shay, Robin Henkel and Sue Palmer. Stoney B will now be playing the blues on the first 3 Wednesday nights of each month at the SpeakEasy, where Lance Dieckmann has been playing the past year or so, but Lance will be back… he will be stopping in to join Stoney from time to time. 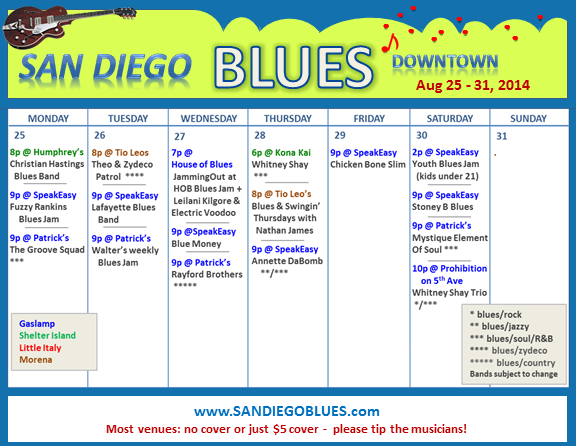 The 4th Wed of the month will be a bluesfest. And this Sunday is the annual BLUSD (local blues society) member appreciation party (non-members also welcome) at Tio Leos (2-6pm), featuring Kid Ramos, Scoty Williams, Mercedes Moore, Taryn Donath, Eric Lieberman, Jon Atkinson, Marcus Bashore, Missy Andersen, and others. I hope you’ll be able to make it.